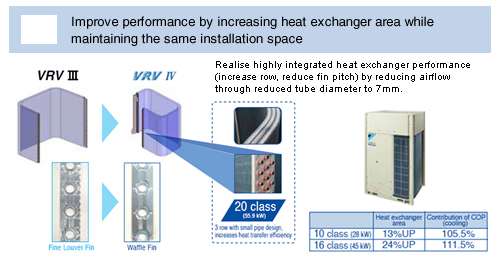 VRV IV Heat Pump is Daikin's answer to the next generation of variable refrigerant volume air-conditioning systems. The VRV IV Heat Pump offers greater design flexibility, improved energy performance with the introduction of Variable Refrigerant Temperature control, superior comfort and reliability of operations to meet the needs of the modern commercial building. Utilizing the latest advances in Refrigeration and Air conditioning Technology coupled with an innovative mindset, Daikin's VRV IV delivers improved efficiency, performance and now incorporates state of the art energy saving technology. Daikin offer models with a capacity of up to 168kW, connection of up to 64 indoor fan coil units, a connection ratio up to 200% (conditions apply), outside air treatment options and a range of BMS options to adapt to the operational and climate demands of the everyday modern building. Daikin's system management and oil-equalizing technology ensures maximum reliability and design flexibility of the system, with piping runs of up to 165m with maximum level difference of 90m between indoor and outdoor units (via field setting only) and a total networked length of up to 1,000m. Daikin's VRV IV now features Variable Refrigerant Temperature technology (VRT), a state of the art energy saving technology that automatically adjusts the refrigerant temperature as the building load varies to maintain optimum comfort conditions whilst keeping operational costs low. With VRV IV, Daikin has made significant improvements from its predecessors in the area's of energy efficiency, responsive climate control and monitoring systems, thereby enabling property managers to better administer the operations of the air-conditioning systems. Daikin's VRV IV delivers high COP thanks to innovative features such as VRT, advanced J series compact inverter compressor and improved streamline airflow design. Standard: Offers high capacity with models ranging from 16kW to 168kW, ideal for large commercial applications. High-COP: Designed with priority in energy efficiency, models range from 32kW to 140kW to accommodate the most modern energy efficient buildings targeting a high NABERS rating. Space Saving: Compact Design, models range from 50kW to 140kW where the condenser footprint or the need to minimize the architectural impact is a priority. In 1982 Daikin launched its first Variable Refrigerant Volume (VRV) air conditioner, since then Daikin has continued to invest heavily in research and development, leading the way in air conditioning technology and innovation with each generation of VRV systems bringing new and improved models and a wider product pool to suit the ever changing market diversity. The VRV IV is the epitome of Daikin's commitment to continuously innovating and enhancing the range, performance, reliability and flexibility of our VRV air-conditioning systems. The result is a total variable refrigerant volume air conditioning solution with large outdoor capacities, compact design, flexible installation and state of the art energy saving technology (VRT) with greater efficiency than ever before. Large capacity inverter scroll compressor made with high strength material and utilizing a thixocasting process housed in a compact casing, 12 class (33.5 kw) compressor utilizing an 8 class (22.4 KW) case. Thixocasting allows the adoption of a thin spiral design, the compression volume is increased by 50% enabling greater performance gains. Compressor uses compact concentrated motor windings, resulting in smaller coil ends that help reduce winding resistance and improve motor efficiency at Low RPM range. This is a key factor that contributes to VRV IV high COP while being able to maintain low operation noise, optimal comfort and climate conditions. 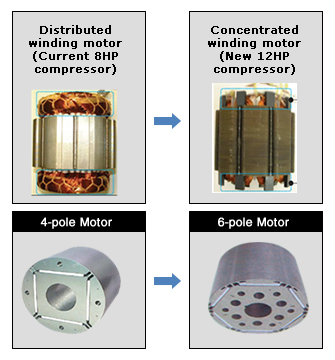 Daikin's jump from a 4 pole motor to a 6 pole motor with 50% more neodymium magnets from previous models is able to efficiently deliver more torque and operate at greater efficiency particularly at low loads. Low operation noise thanks to an increase in heat exchanger area coupled with a stream line grille design and scroll fan that promotes swirling airflow discharge to reduce vibration and pressure loss. Increase heat exchanger surface area of up to 24% over previous models for greater heat transfer efficiency while maintaining a compact installation space. 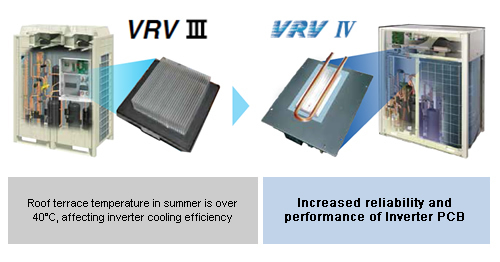 VRV IV Inverter Power Module is Refrigerant cooled compared to its air cooled predecessor which results in more reliable operations particularly under high ambient conditions where system integrity may be affected. VRV IV Inverter PCB allows stepless frequency control of the compressor from 60 to 408Hz allows precise control to match the required capacity to load and in turn improving energy efficiency. Auto-Sequencing Technology: VRV IV unit sequencing operation is automatically enabled on startup and after each 8 hour period of operation to ensure balance operation of each outdoor unit to improve compressor longevity and stability. Download the latest VRV IV Product Brochure for more information.